Clarity Alliance announces Bristol Best of Show winners | What Hi-Fi? Here are some of the finest hi-fi and home cinema demos you can see and hear at the Bristol Show this weekend, so be sure not to miss them. The judges have scoured every floor of the Bristol Sound and Vision Show 2017 and the results are in: here are five of the best exhibits as chosen by the hi-fi and AV industry trade body Clarity Alliance. 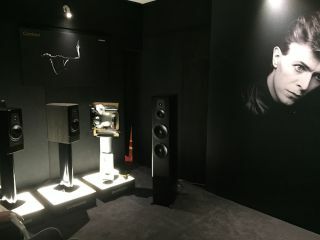 The Best Display Award went to Dynaudio for its room featuring a giant picture of David Bowie and a smart display of the company's speakers (shown top). Best Home Cinema room was awarded to Arcam for its full Dolby Atmos rig, which it took to ISE in Amsterdam before installing it at the Marriot Hotel in Bristol. And it was KEF's demonstration of its new wireless, active LS50 speakers linked to a Zenith Innuos streamer that led the judges to crown it the show's Best Sounding Hi-Fi demo. Devialet picked up the Best Innovation Award for its innovative Gold Phantom speaker, while the overall Best of Show Award went to Naim Audio which is showing off its new Uniti range. Naim's former managing director Paul Stephenson (above right) was given a Clarity Honorary Fellowship for his lifetime's dedication to the audio industry and his success in transforming Naim into the world-class company it is today. He was presented with the Award by newly-elected Clarity chairman Tom Barron of PMC.